In a large mixing bowl, blend together dry ingredients—oat flour, coconut sugar, rolled oats, cocoa powder, baking powder, baking soda, and salt. Add shredded zucchini, milk, coconut oil, flax egg, and vanilla extract, stirring until well combined. Stir in chocolate chips and then spread batter into prepared pan. 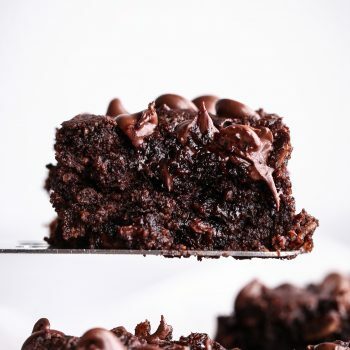 Top with additional chocolate chips and bake for 25–30 minutes, or just until center is set. Let cool before cutting into bars. Makes 9–16 bars, depending on how large you cut them. Store in an airtight container in a cool room for 2–3 days or in the refrigerator for up to a week. *Can make your own oat flour by grinding rolled oats in a food processor or coffee grinder. Just be sure to measure the flour after grinding.